Oobleck acts like a liquid when poured and like a solid when a force is acting on it. You can grab it and yet it will ooze out of your hands. If you have read “Bartholomew and the Oobleck”, you know well what to do with an Oobleck! 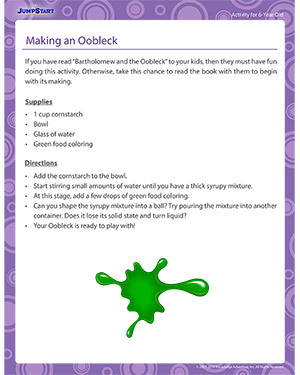 Download the printable activity and follow these easy steps to make your own gooey oobleck at home!